27 Apr 2018, 11:10 a.m. The price of vanilla per kilogram is now over $600 for the first time since 2004 – surpassing the current price of $550 per kilogram for silver. Tropical storms have battered Madagascar, the world’s primary vanilla producer, leaving the crops in dire straits and a sour taste in the mouths of buyers. 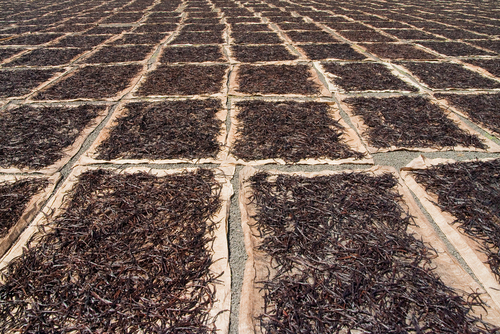 The lack of supply, coupled with a cultural shift from synthetic to natural vanilla, has driven prices up - approximately a 1100% increase since 2013 when vanilla was only $50 a kilo. The small African island nation is responsible for around 38% of global vanilla supplies (just behind Indonesia), and businesses across the world are already struggling for supplies. Madagascar produced 3,100 tons of vanilla in 2017 but with over half the crop destroyed 2018’s output could be as low as 1,500 tons. Cyclone Enawo hit the Sava region – the primary vanilla territory – in northeast Madagascar in March 2017. The devastation killed 81, left 250,000 homeless, and destroyed 1/3 of the vanilla harvest. Drought followed, limiting recovery, and in 2018 the region has already been hit by Cyclone Ava and Cyclone Gita, destroying approximately half the maturing vanilla pods on the vines. The last big storm was in 2004, when Cyclone Gafilo hit Madagascar. The storm was the most intense tropical cyclone ever recorded in the southwest Indian Ocean and wiped out vast quantities of vanilla crops, forcing the price up sharply. Within a year, with good weather, the crops were back to the same production levels and the price returned to around $50 per kilo. 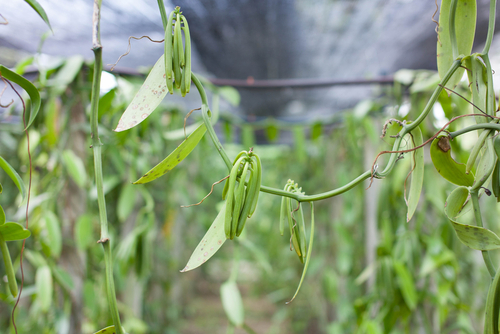 Vanilla pods in their early 'green pod' growth phase. Vanilla plants take 3-4 years before they produce pods that can be harvested. This is a long process, but it gets longer when you realise that the Melipona bee, which naturally pollinates vanilla, is not native to Madagascar – meaning pollination is done by hand. 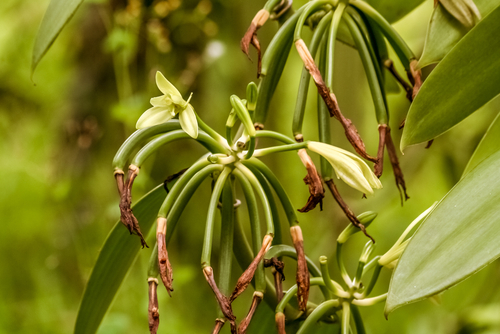 Vanilla pods take nine months to reach the required maturity and the plant only flowers once a year, so it needs constant attention and inspection to get the most valuable crop possible. Madagascar is a poor country, with approximately 70% of the population below the poverty line earning around 88p a day. With poverty comes a rise in petty theft, and vanilla’s new-found value makes it an attractive target, but this isn’t Madagascar’s main problem. Criminal activity is rife in Madagascar. As this article from The Guardian reports, gangs buy off politicians to continue their illegal felling of rosewood trees to be chopped down and stripped into wood suitable for furniture – most being bought in China. The trees are protected, and their sales make them the world’s most trafficked wildlife commodity. Gangs have turned to stealing vanilla to then disguise the money generated from these illegal sales, but farmers and local residents have taken the law into their own hands and started fighting the gangs – with many extrajudicial killings occurring and the police turning a blind eye.